Bushes and shrubs surround us. They’re woody plants with many stems. As perennials, they live for several years and can grow to heights of fifteen to twenty feet tall. When they grow so tall and big, they can become overgrown. What are some tips for trimming overgrown bushes and shrubs? The best time of the year to trim tends to be late winter or early spring– so the second half of March or the first part of April for much of the country. This is the ideal time because it’s right before new growths form after the dormant period. When you do trim at this time, avoid trimming whatever looks new. New growth is good growth– it’s the older stuff that needs maintenance and trimming. If this time of year won’t work for you, for whatever reason, then another time of the year to consider trimming is at the end of summer in late August or the month of September. This is the time of the year when a plant has finished growing for the year. Timing-wise, trimming bushes and shrubs makes sense once a year. That said, take a three-year approach with respect to sections to be trimmed. For instance, the first year you can remove the bigger, older branches near the bottom of the plant. Use sharp shears or clippers. Cut branches at their base. During the second year, remove more old branches toward the middle and top of the plant. Then, for the third year, concentrate on shaping the bush or shrub as desired. 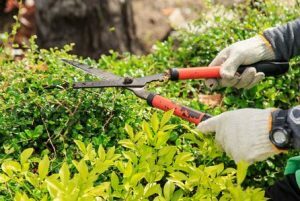 Trimming can include removing unwanted growths, as well as dead parts, new shoots growing from the ground, and any old blooms or flowers. By keeping a trimming schedule, you’re ensuring that your plants will look their best over the years. If this kind of work doesn’t interest you in the least, and you’d prefer to have a professional worry about it, please contact Forest Tree Service in Kingwood, Texas, at 281-359-7874. We can properly trim your bushes, shrubs and trees to grow strong and healthy, and even turn an eyesore into an asset!